Last time I wrote about this subject, a whole bunch of people got offended. Apparently, it’s not fair to make sweeping generalisations. So I won’t be mentioning that BMW drivers are top the the ranking for abusing and misusing their car horns. Nor will I be singling out Diane Greenwood from Cleveleys, Lancashire. 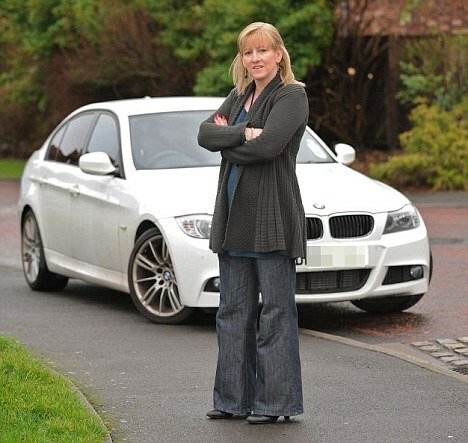 She’s certain that the proposed 20mph blanket speed limit in her town will damage her BMW 320d. Apparently, driving it in third gear at such low speeds will put too much strain on the engine, increase fuel consumption, and harm the environment. Just four people killed in 2008 within the kind of distance that Diane probably drives her BMW when she’s “on short journeys around her home town”. Oh, and three in 2007; NONE in 2006; five in 2005; one in 2004; three in 2003; four in 2002; two in 2001; one in 2000; and two in 1999. So that’s just twenty three people killed on Diane Greenwood’s local roads. It’s no wonder she sees no reason to slow down. I had a BMW for three years. I can confirm that it is perfectly possible to drive these fine examples of German engineering at exceptionally slow speeds for miles and miles without causing any damage to the engine at all. I have crawled in daily traffic jams on the M4, in the course of my travels as a management consultant, with no ill effects – well, not to the car, anyway. But then, I never used my horn much either. I guess I wasn’t a proper BMW driver. Er… 20mph is a tick over 30 km/h which is a very common speed limit here and I don’t see any BMW’s falling apart as a result. I was going to make that point, but then realised that driving a BMW is probably a very anschloss experience. …and she’s parked up on the pavement. Nice of her. We had a few Mitsubishi Shoguns at work where there is mainly a 20 mph speed limit. There was a recurring problem with the particulate filter blocking up in the exhaust. Mitsi blamed this on the low speed limit, although the vehicles also spent a lot of time ticking over which is probably far more likely to be the problem. Even so, if driving at less than 30mph is a problem for a vehicle, it isn’t everybody else’s problem is it? Maybe Diane should save the Beemer for trips up & down the M6 & get a bit of exercise locally! OMG. Can I say “selfish cow” ? I (still) have a BMW and have had them for years. I don’t think I have ever used the horn (other than once – in an empty car park when I wondered what it sounded like). I’m also sufficiently boring that I keep to speed limits. I also have several bikes. I wonder what Diane’s engineering qualifications are? I’m a Chartered Engineer and have a suspicion that her understanding of how her engine management unit works is rather flawed. However, if you bash all BMW drivers on the basis of a limited selection then presumably you accept claims that ALL cyclists are reckless because of a few pavement-riders and suchlike. I have a BMW estate. Before that I had a Honda accord , before that a Peugeot 405 estate, before that a Citroen Zantia and several before.Gosh a lot of cars, all hatchbacks or estates for carrying dogs or more usually my bike to sportives or to bases from where we go on cycling holidays. I regularly slag off people as too stupid to separate stereotypes from reality when they add comments on Daily Mail type websites lambasting cyclists. And Jeremy Clarkson. Now your observations about this particular woman are spot on. She is a complete f*****g idiot. @Carlton. Apparently most people think irony is what cars are made from. Though Audis are actually made from aluminium. @Rix. Please refer to the Telegraph piece for the statistical breakdown – it’s a simple majority of the sample, and no confidence limits were expressed. @herlihy. Thank you, but to be fair, I never claimed to be. Driving at 20mph will definitely clog the particulate filter. But so will 30mph…. To clear a DPF the car needs to be driven above 40mph constantly for 10 mins, an average speed in a 30mph zone? Can I just offer the traffic calming reminder that this “story” was in the Daily Mail, a newspaper not noted for its true or faithful representation of the world and its citizens. Personally I think that anyone who owns and uses a car is a victim. I’m not sure what of, but I do feel sorry for them. Reading the article, I see that she thinks that the roads are too wide for such a low speed limit. I think her point is that if you’re going to have such a low speed limit, you need to take some space for the cars and reserve it for separated cycling infrastructure. Problem solved! “… To clear a DPF the car needs to be driven above 40mph constantly for 10 mins, an average speed in a 30mph zone?” – Not quite, but probably true of BMWs though. Note that depending upon the distribution of car speeds, it’s reasonable to assume that ~50% of cars are speeding. This may be stating the obvious, but how can average real-world speeds exceed the speed-limit unless some serious and widespread speeding is involved? I am assuming that the average speed is the average number of cars multiplied by their individual speeds. So the number of cars exceeding the speed limit multiplied by their speeds, more than compensates for acceleration from stationary and the speed of law-abiding motorists who have to obey speed limits, take proper observations, stop, not jump red lights, not drive on the pavement, not overtake dangerously & etc. Forty nine per cent of cars on motorways were travelling at a speed that exceeded the 70 mph limit. The ITOWorld visualisation tells a rather different story. Although people like that selfish speed-obsessed maniac think it’s OK to sacrifice the innocent on her front bumper, just so that she can shave a few minutes off her journey. I suspect she has a row of stickers on the other side of her car listing her road-kill tally. That’s a really nice visualisation. Unfortunately, I don’t think it’s complete – I checked against a couple of fatalities that I know about, and they weren’t listed.